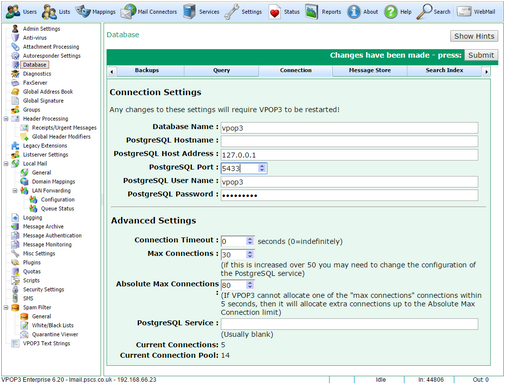 This page lets you configure how VPOP3 connects to the PostgreSQL database server. It is rare that you will need to change these options, and if you do you must restart VPOP3 for them to take effect. Note that these settings are different from other VPOP3 settings in that they are stored in a file called VPOP3.INI in the VPOP3 installation directory. If you need to change the database connection settings when VPOP3 is not running you can edit that file directly using any plain-text editor, such as Notepad. •Database Name - the PostgreSQL database name that VPOP3 is to use (the default is 'vpop3'). •PostgreSQL Hostname - use this setting if VPOP3 is to connect to PostgreSQL using a host name (eg 'localhost' or 'db.example.com') instead of an IP address. 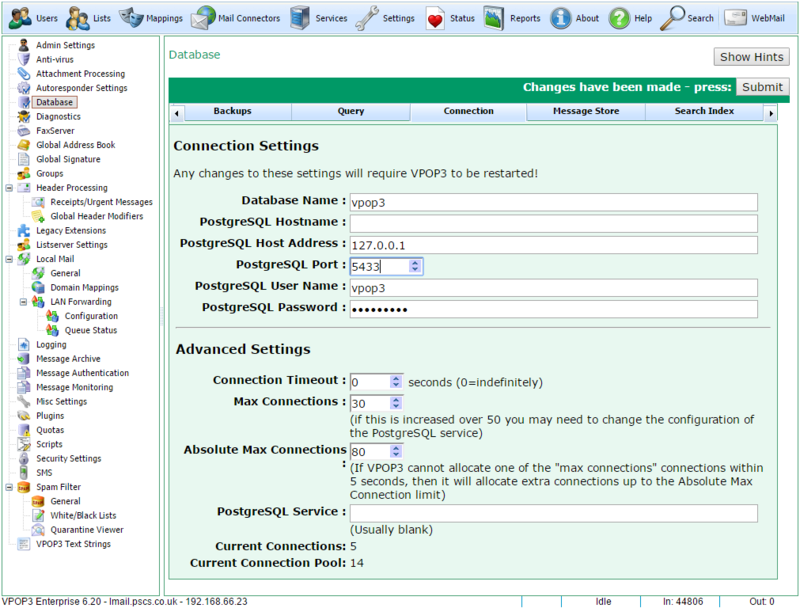 •PostgreSQL Host Address - use this setting if VPOP3 is to connect to PostgreSQL using an IP address (IPv4 or IPv6 are allowed - eg 127.0.0.1 or ::1). •PostgreSQL Port - use this setting to tell VPOP3 which TCP port PostgreSQL is listening on. The default is usually 5433. PostgreSQL's default port is 5432, but VPOP3 doesn't use that to avoid conflicting with any other PostgreSQL software on the same computer - the installer finds the first free port higher than 5432, which is usually 5433. •PostgresSQL User Name - the username used to log into PostgreSQL to access the specified database (the default is 'vpop3'). •PostgreSQL Password - the password used to log into the specified user in PostgreSQL (the default is 'vpop3pass') . •Connection Timeout - how many seconds VPOP3 will wait for a connection to the PostgreSQL server to be established (default is 0 - wait indefinitely). VPOP3 uses a 'connection pool' to connect to PostgreSQL. Establishing a connection to the server can be slow, so once VPOP3 has made a connection and finished with it, rather than releasing the connection, it puts it into a 'pool' where future connection requests can reuse it rather than having to establish a new connection. If the connection in the pool is not used for a long time, VPOP3 will close it. Each connection to PostgreSQL will create a new 'postgres.exe' process which can be seen in Windows Task Manager. The default PostgreSQL connection allows up to 100 connections at once, but several are needed for system purposes. •Max Connections - the maximum number of connections normally allowed in the connection pool. •Absolute Max Connections - if VPOP3 needs a connection and there are no free connections in the pool, it will wait for a few seconds and then make an extra connection up to the Absolute Max Connections limit. (If it needs further connections after that, then it will wait indefinitely for one to become available). If VPOP3 has to make connections like this it usually indicates a performance or overloading problem on the server. Below this are counts showing how many connections are currently in use and how many are currently in the connection pool. This should normally be below the Max Connections limit above. In the above screenshot, there are 14 connections in the connection pool, 5 of which are being used (9 are unused and available instantly if needed).